Ever have a friend who tells stories that never seem to go anywhere? There might be a point in there somewhere. But by the time it’s arrived, your eyes have rolled back in your head and you’re hoping to get struck by lightning so you can get out of this conversation. It’s boring. And it’s annoying. So let’s make sure that your audience never feels that way about your content. In the work I do with our content marketing students, I’ve critiqued hundreds of blog posts. One mistake I see over and over is content that’s interesting and well written, but that wanders all over the place before it gets to the point … if, in fact, it has a point at all. Creating aimless, fuzzy content wastes your time. Even worse, it wastes your audience’s attention. Your audience wants content that makes a solid point and gets there quickly. And improving that for your own content is one of the quickest ways you can get better. What are your goals for this piece of content? What one thing should your audience take away? Publishing good content can do lots of great things for you. You can attract a larger audience, nurture prospects so they’re more likely to make a purchase down the line, inspire your audience to take action, find new allies to help you promote your work. But you probably won’t do all of those with a single piece of content. Instead of creating shaggy-dog content that wanders around trying to do everything, understand which single point in the constellation this piece of content will represent for you. Even more importantly, what will this piece of content do for your audience? What will they be able to do, become, have, change, or avoid after they’ve read it? What transformation are you presenting to them? Now, a single blog post usually won’t create a “Sliding Doors” dramatic life change. But being able to, say, come up with a headline idea any time you need one is a pretty cool thing to be able to do. It’s a memorable transformation, even if it doesn’t change the course of your life. What memorable and meaningful transformation will you make possible with this content? You want to know the answers to these two questions before you start writing. And then you want to mentally put them aside for a while and just get some words down. Yes, you’ll meander. Yes, you’ll have tangents and dead ends and even some fluff. That’s all okay. In first draft land, we get to indulge ourselves. And failing to make room for that can give you a case of nasty writer’s block. Just write it. The post, the script, the creative brief. Just write. For as long as you need to. Get the ideas distilled into words, even if they’re lumpy and imperfect. The more you write, the more raw material you’ll have when it’s time to edit. And pouring plenty of words into the page, as quickly as you can, will often reveal fresh observations that will make your content stand out. In a perfect world, you’ll have the time (at least 24 hours is great) to let your first draft rest while you do other things. That will let you come back to it with fresh eyes and a sharp mind. Now carve away the cruft and get to the good stuff. It’s time to look at your two questions again. Does the content you drafted have the same answers? Does it serve the original goal you had in mind for it? And does it deliver the desired takeway to the audience? The answer might be Yes, which is great. Or you may decide that in doing the work, you’ve come up with better answers. That’s even better. Either way, make sure the post speaks to those answers at every point. Every story should answer one or both of those questions. Every paragraph should serve one or both of those questions. Every word should reflect one or both of those questions. This is also when you make sure that the introduction to your content moves briskly to the point, before boredom or annoyance have a chance to settle in. Whatever your content creation process looks like, deciding on your goals before you write, then revisiting them during your edit and polish, will make sure that your content gets to the point … and stays there. 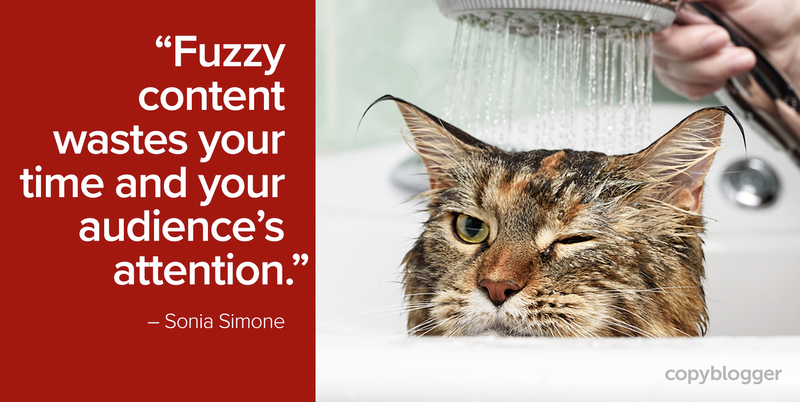 And when your content has a well-defined purpose, both for you and for your audience, you’ll banish audience boredom and make sure you’re spending your time wisely. We’ve been working hard behind the scenes on a brand-new educational resource for you. It’s a focused course for content creators that will help you build any digital asset on a rock-solid foundation. You can use these techniques for blog posts, podcasts, a video channel, or any other content marketing project. This is a four-week course and we’ll be opening it up to new students very shortly. Drop your name and email below if you’re interested in getting more details! I, too, am doing my best to focus on just writing. Yet I’m still not doing it! LOL But coming back to this blog is a friendly reminder for me. Here’s to all of us procrastinators to simply start! start soon. Great piece of work, Sonia! I find that I’ll get overwhelmed if I think too much about the volume of content I want to get published, but if it’s “figure out the point of this piece and get the subheads together,” that I can tackle … and then come back to it the next day and I’ve already got some momentum. Great advice. Most people don’t realize how fast people stop reading a blog post. The introduction is one of the most important parts because someone should know right away the benefits of keep reading the whole content. It’s pretty common to find boring introductions out of the topic, telling stories or even random stuff, even if the content is good, people think that there is a lot of fill and they want answers fast! That’s why tools like Google Analytics are there for anyone to use, knowing the issue, someone can think about a proper solution. Getting traffic is one thing but what’s the point if the audience retention is non-existent? Sometimes you win, sometimes you learn, reading other blogs is a great way to learn how to write better. I think that a personal touch can make the difference compared to a soulless content. Excellent stuff! You’re making me rethink how I approach content making! 1. What are your goals for this piece of content? 2. What one thing should your audience take away? These are powerful questions. Thanks for the post! This is super helpful information to improve one’s writing skills and for better blogging. One of the most important pieces of advice, I would say, is to just write and write, and then let that first draft rest for 24 hours. I heard similar advice before, I think from Derek Halpern at socialtriggers.com. This is something I like to practice myself. I like to just write, and then let that content rest and come back with fresh eyes the next day. Doing this has helped me craft better articles for my audience. It works! The “let it rest for 24 hours” is one we’ve been preaching for a long time, and Larry Brooks was kind enough to write a guest post for us about it as well. It’s amazing how helpful it is. Really amazing article Sonia. Thanks. Love it, Sonia! Great advice. Thinking about it, I always liked to write “how to” posts that give people practical advice. I’ve never been good at writing the “why” type of posts where you explain something, but in the end, there is nothing tangible for people to take action. Too much “why” without any “how to” can definitely get frustrating. 🙂 But it depends on what you’re setting out to do, as well. Thank you for this article. I’m just getting started with by first blog / website, and I want to make sure I’m writing engaging content. Your post is making me re-think everything I have already written. I’ll definitely be coming back for more advice. Thanks again! Great advice here for creating purposeful contents. Being diverted from the topic is normal for content creators. As you said, to keep focus on the topic, we need to ask both questions ourself before start writing. In fact, I always ask two question to myself before start writing. These are – 1. Why am I writing this post? 2. Why should my readers read this post? I know, these questions are same as yours. However, thanks for sharing this. Funnily enough, I had this exact same problem with an article I wrote for an academic journal and the most recent chapter in my PhD. The problem? I got too excited by the content (horror films) and forgot to refer back to my research question. So I’ve got well-written content, it just doesn’t really do anything. As I’m revising them, I’m continually asking, “does this answer my question?” Once it does, I move onto the next part. I’ll definitely be doing the same with my blog content! As a copywriter in the marketing organization of a Fortune 500 tech company, I often get asked to write and/or edit a piece that, what I like to call “tries to shove 5lbs of s___ in a 1lb bag”. Why do people insist on doing this? I therefore must also catch myself from doing it and picking up their bad habits. Not as easy as it sounds :). Thanks for the reminder to pick a single goal for the piece and achieve that one goal. It makes the article/ad/email/etc a better read for sure. For me, the writing comes easily. It’s those 2 questions that trip me up. Sometimes I write a few hundred words just to get to an answer. I often just feel intuitively what I want to share and the purpose of writing it and the takeaway don’t come until later. I’m not sure what I want them to do with that, though. Thank you so much the two questions are item I keep forgetting to ask myself. I will write what I like but often I get some shares but nothing earth shattering. So i am trying to get back to basics so I can find the bad habits I need to break. The big one is rereading a day or so later.